Capstone Publishing is starting 2012 off in a big way with their DC Super-Pets series of full-color graphic novels, which start to hit the shelves this month. Here’s part of their promo advertisement: “The DC Super-Pets series features the crime-fighting adventures of the pets of favorite super heroes from beloved DC Comics: Superman, Aquaman, Wonder Woman, Batman, and Green Lantern. 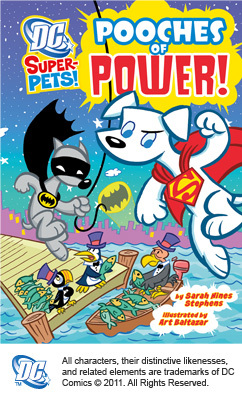 These intrepid Super-Pets—Krypto the Super-Dog, Ace the Bat-Hound, Streaky the Super-Cat, Beppo the Super-Monkey, Jumpa the Super-Kangaroo, and their friends—save the day and foil the evil plans of the universe’s most dastardly super villains. The books have been specially designed for children just learning to read independently. Included in the endpapers are illustrations of all the Super-Pets in the series (both heroes and villains), jokes, and a guide to the meaning and pronunciation for each book’s most challenging words.” Look at this series and you’ll realize you never knew there were so many super pets! Each of these 56-page trade paperbacks features the art of Eisner Award-winning DC Comics artist Art Baltazar, with scripts by Scott Sonneborn, Sarah Stephens, Jane B. Mason, John Sazaklis, and Donald Lemke. Capstone also has an interactive web site for the entire series.